DC China Meat Products is an American company based in Montclair, CA that focuses on making meat snacks for asians living in the USA. They make jerky at their own facility. Their products are mostly sold in asian food stores. A couple of months ago, I reviewed their Curry Dried Beef. I found this package of "regular dried beef" while perusing a 99 Ranch Market one day. 99 Ranch Market specializes in Chinese groceries. 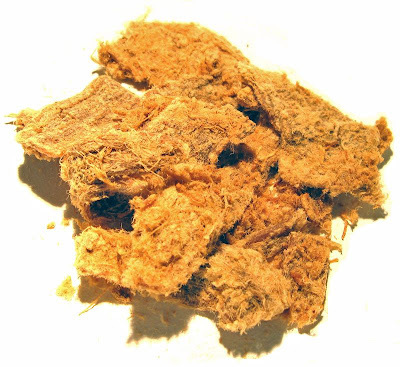 "Dried beef", interestingly, is what jerky is called in asian communities. Asians do use the word "jerky", but they use it to describe American-style dried beef. The stuff I'm reviewing here is the chinese-style. 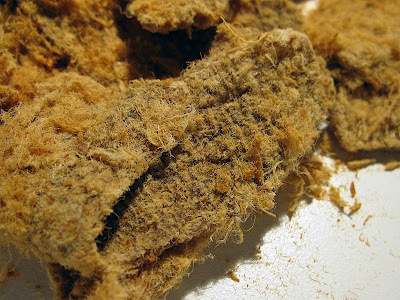 In the photos below, notice that this dried beef is encrusted with furry fibers. These are meat fibers infused with flavoring and then adhered to the meat surface. It's pretty typical with chinese style dried beef. Beef, sugar, soy sauce, wine, salt, monosodium glutamate, vinegar, spices, sodium nitrite. The tastes I pick up from the surface of these pieces include a soy sauce flavor, a slight salty flavor, and a bit of sweet. In the chewing, I continue to taste the same surface flavors, and some natural meat flavors. Some of my first thoughts on this is that it's largely bland, with the soy sauce flavor being the only identifiable flavor. The furry meat fibers all over these pieces makes it feel like I'm eating a plushie toy, but the moisture from my mouth eventually smoothes them out. The soy sauce flavor is clearly the dominant flavor of this jerky. This is the chinese-style soy sauce, not the japanese style, which seems to have a sharper flavor. I said there was a bit of sweet on the surface of these pieces. I continue to taste that flavor through most of the chewing, and I'd rate that as the second-most dominant taste of this jerky. The natural meat flavors seems to come mostly from the furry meat fibers, and not from the meat pieces themselves. Either way, you still get some natural meat flavors out of this. I'd rate the meat flavors as being the third-most dominant taste overall. The level of salt intensity is not that much, probably light. Overall, it's not that flavorful of a jerky, perhaps a light flavor intensity, and not really much flavor complexity. These appear to be slices of whole meat, sliced thin, and in small pieces. This is dry jerky, very dry. However, there still seems to be a fair amount of flexibility to these things. It's still easy to tear apart, though the chewing may take a moderate amount of effort. The chewing texture is somewhat meat-like. The furry meat fibers all over these pieces do contribute a fibrous character, but the actual meat pieces seem to be more crumbly, and after a lot of chewing it feels more like fine meat granules. My fingertips do pick up some of the very fine dust on the surface of these pieces. I'll find some of the furry meat fibers falling off each piece as I pick it up. Don't a tear off a piece with your mouth unless you hold your hand underneath, because fibers will be falling all over your chest and lap. It's wise to first shake a piece in the bag, or over a plate, before lifting it over your chest. There's a lot of meat fibers in the bottom of the bag. It's hard to tell if there's any bits of fat on these pieces, being so well covered in meat fibers. But I don't really taste any, and I haven't chewed into any connective tissues. I paid $1.69 for this 1.5 ounce package at a 99 Ranch Market in Irvine, CA. That works out to a price of $1.13 per ounce, making this an average priced buy, towards the lower end. For general jerky snacking purposes, at this price, it's a fair value. I'm not getting a lot of snackability out of this. Maybe the first few pieces is interesting, but it gets rather boring quickly. It's taste is just rather dull, and doesn't have me reaching for more. Even though the price is fairly low, it's not enough to make me want to buy this again. If you purchase this, then get the 1.5oz bag like the one I'm reviewing. I'm guessing if you buy a larger sized package, you might not feel interested in finishing the whole bag, and may find yourself having wasted money. I just don't find much snackability in this. The flavor is largely one-sided as just a light soy sauce flavor. While there's also a sweet flavor, and some meat flavors, it still comes off rather uninteresting. The curry variety that I reviewed last November was much more enjoyable. The meat consistency is good, it's easy to eat, though maybe requiring a bit of chewing. And while the chewing texture is not exactly all that great, I can usually overlook that for a great taste. But, it's just not an interesting taste. It's not bad, just not anything exciting. As for all the meat fibers sitting in the bottom of the package, I think they'd be great as a sprinkle over a bowl of steamed rice. My beer recommendation, just a light blonde ale. This stuff is the best. I wish it was sold online somewhere.